Rob and Tamara found the “up north” feeling they were looking for on their wooded lot in Bloomington. Remodeling their home made it fit their family’s lifestyle perfectly. When Rob and Tamara bought their Bloomington home in 2005 they were head over heels for the location. They fell in love with the “up north” feeling the area provided without having to leave the Twin Cities. For the family, it was the perfect blend of both worlds. “We made the decision to bypass a cabin and instead spend a little more to live in this wooded area,” explains Tamara. The home was right across the street from Bush Lake and surrounded by trails for hiking and skiing and lakes for fishing, paddling, and swimming. But even with their dream location, the old appliances, an underused formal dining area, and a tiny coatroom and laundry room had them searching for a solution. 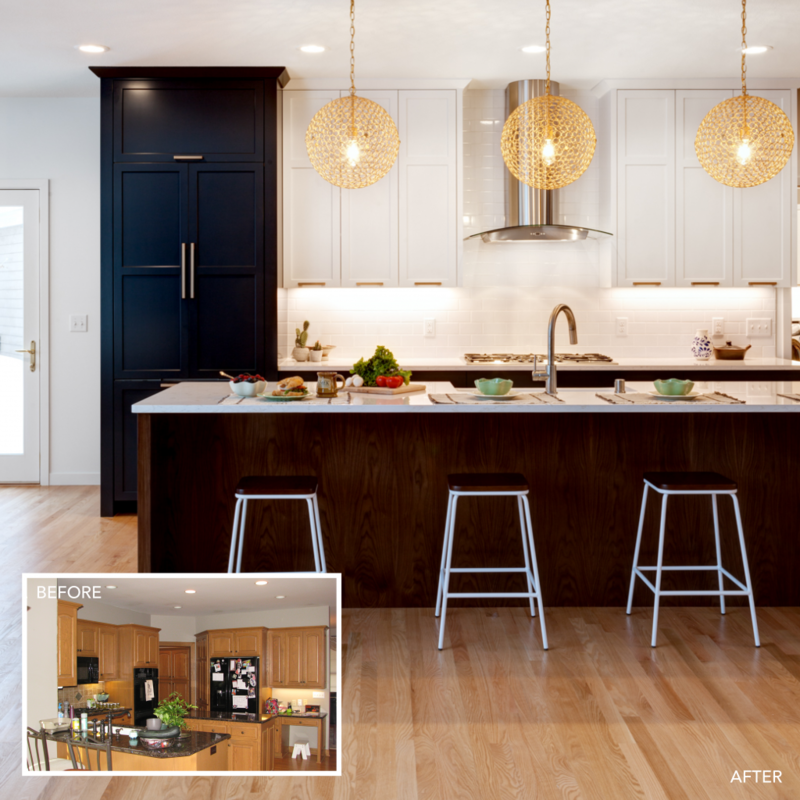 When the family started looking for a remodeler to take on their project, they wanted a team that was creative and innovative, but still able to listen to what they wanted in their space. They also were seeking a good value. “We wanted a fair price for the project, meaning we didn’t want the cheapest bid, but a bid that would deliver the highest quality and allow us to reach them for help if necessary after the project’s complete,” explains Tamara. Rob and Tamara found just what they were looking for in AMEK, Inc., a Bloomington-based design and build remodeling company. They were looking for a team that has strong relationships with their subcontractors and were impressed with AMEK’s close relationship with Mingle, a Plymouth-based kitchen and bath design showroom. Together, they were able to work on design solutions that fit the space and the family’s lifestyle, all while suiting their taste. The kitchen was reconfigured to make way for a long island where they now eat dinner with their son, Ashee (13), and daughter, Gia (11), and they transformed the old sunroom into a new dining room that feels much more relaxed. New appliances, countertops, and a special steam oven to craft lower calorie meals tailor the kitchen to Rob and Tamara’s lifestyle perfectly. Navy accents in the kitchen add a pop of color and complement the modern, funky design of the updated fireplace area. 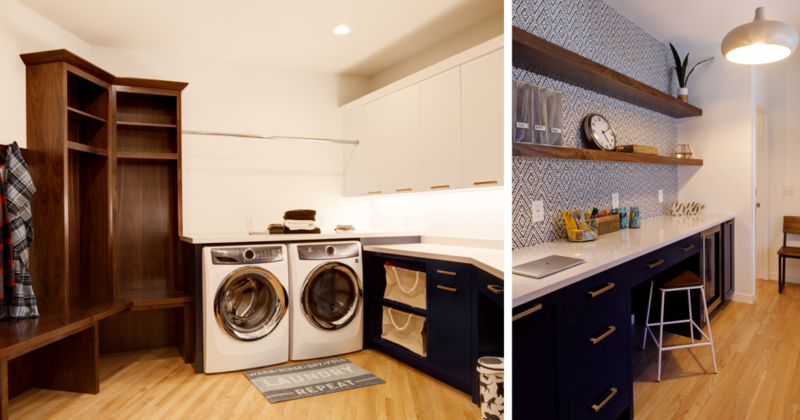 The once cramped coat closet and laundry room were combined to create an expansive entrance and mudroom with multiple storage lockers, laundry, and a home base for their pets. As a central part of their family, they took great care to ensure their pets had a place to call their own. Tour this home on the Spring 2019 Remodelers Showcase | R16 from AMEK, Inc.